The hawks have brought me many messages throughout this past year. 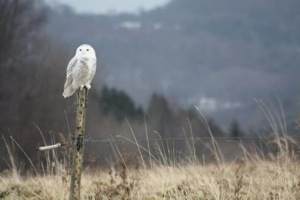 Now snowy owl has shown me patient power. Not the physical strength of the talon or the pectoral muscles that make flying effortless, rather a state of grace that embodies these beautiful, noble birds. To watch a snowy is to understand the true meaning of patience. It spends most of its life perched or standing on the ground only moving its head to take in every aspect of life around it as it looks for prey. I have been so fortunate this winter. 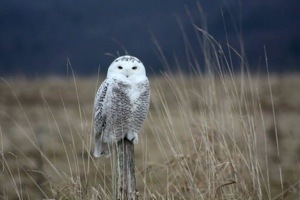 I have seen 6 different snowy owls. Here is a picture of my favorite encounter on the Grant Rd in Cold Brook.